Lady Bird starring Saoirse Ronan and Laurie Metcalf. Creating a film that so many people can identify with is not an easy task. The sheer amount of people who have responded to the film and title character in such a positive way leads one to believe that Greta Gerwig has succeeded with Lady Bird. 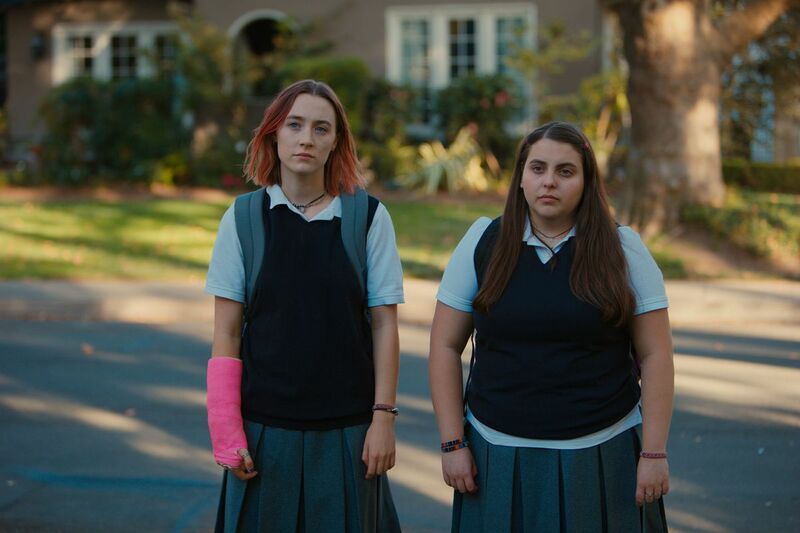 Many people, young and old, who have seen Lady Bird have responded by saying, “That character is/was me!” or, “That is exactly how I felt about my parents/school/hometown/friends growing up!” and that is a true sign of success for a writer/director – aside from the movie being nominated for five Oscars. This is Gerwig’s directorial debut. Lady Bird could take place in any decade and in any town but it happens to be Sacramento in 2002. Lady Bird (Saoirse Ronan) is in her senior year at a pretty normal Catholic high school and trying to figure out what she wants to do for college. On one hand it’s a fairly standard coming-of-age story where nothing exciting or out of the ordinary happens, but on the other hand it is completely unique. Lady Bird – an odd name, but soon it’s the last thing on your mind – has a strained relationship with her hard-working mother (Laurie Metcalf) and is yearning for independence and adventure. She is trying to fit in but at the same time is trying to break free. What you get is a very funny and very touching story of a seventeen-year-old navigating through one of the most important times of her life. Saoirse Ronan (Brooklyn) has been one to watch since she broke out in 2007 with Atonement. Her role in Lady Bird has earned her a third acting nomination in ten years, which is very well deserved, especially for a twenty-three year old. The interactions between Lady Bird and her parents are timeless, and that is probably thanks to the brilliant Oscar-nominated script. It’s so good and so real that you probably won’t even notice it, which is the sign of an amazing screenplay. Laurie Metcalf (Roseanne) is also nominated for her supporting role as an overworked, underpaid, and underappreciated mother of two. Special mention goes to Beanie Feldstein who plays the extremely likeable best friend. Since Lady Bird doesn’t follow the traditional flow if a film with an introduction, climax, and conclusion, it feels more like you are just observing a girl’s senior year unfold and not watching a movie at all. You feel like you just popped in to observe a piece of Lady Bird’s life; you know a lot happened before you got there and you feel that the characters are still living their lives after the credits roll. What’s a shame is that in the absence of action or a plot twist, a few people will mistake Lady Bird for boring and mundane. What they won’t get is that that is the whole point – high school is generally unexciting, but at the time, losing a best friend, falling in love, figuring out your future, and trying new things is the be-all-end-all of your life!